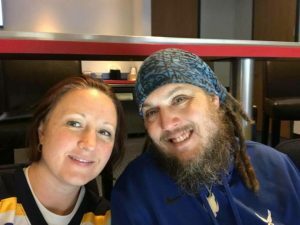 My dad took a break from football to make some wishes come true at a couple of hockey games. 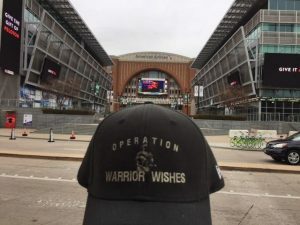 We have an amazing opportunity to host a large group of warriors in a suite at the Dallas stars game this Friday & the Blues offered to host warriors in their suite Wednesday night! I drove my dad to the train station early Wednesday morning. When I got in my car, the temperature reading was -7 degrees…. it was bitterly cold. 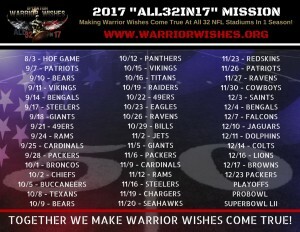 Thankfully my dad was heading south & will be hosting warriors in domes over the next few days. My dad took the train to downtown Chicago & braved the cold for a couple of hours while he waited for his bus to take him to St Louis. 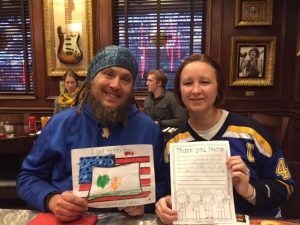 He arrived in the Gateway city just before 3 pm and immediately made his way to the Hard Rock Cafe to meet up with Air Force Veteran Greg Miller and his wife Heather for dinner before that game. 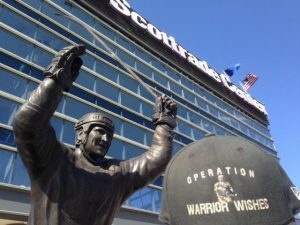 He had hoped to meet up with a couple of Warrior Wishes alumni guests, but unfortunately they were unavailable. Despite the frigid temps, my dad managed to snap a few pics by stadium on his way to the restaurant. Greg & his wife arrived around 4:30. 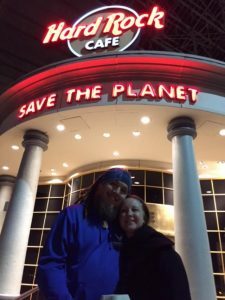 The Hard Rock Cafe in St Louis have been helping make wishes come true for a few years. We are truly thankful for their partnership & generosity! Over dinner, my dad got to know the Miller’s before the game. He learned about Greg’s artistic talent & about how he mentors veterans & students in art, using art as therapy. His wife, Heather, has her own set of talents. She has run numerous marathons and Ironman’s. 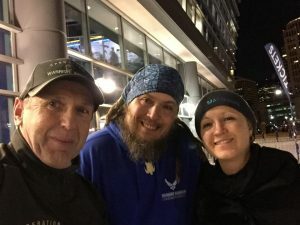 Heather has completed a marathon in 46 of the 50 states within the last 7 years! Truly incredible! Before making their way over to the scottrade center, my dad presented Greg with thank you letters from the kids at Clinton elementary. The group eventually ventured back out into the arctic chill & walked a couple of blocks to the stadium. 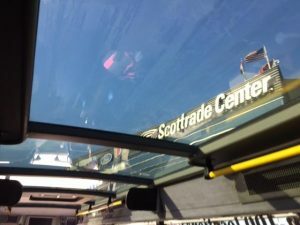 The Blues went above and beyond by providing our guests with “Penthouse Suite” tickets! 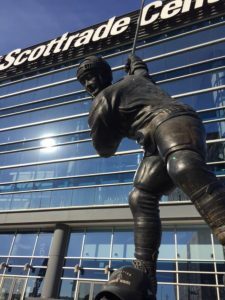 But unfortunately, the Blues were defeated by the Nashville Predators by the score of 2-1. 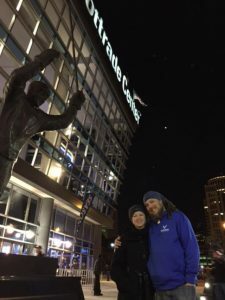 Despite the loss, Greg & his wife had an unforgettable experience! 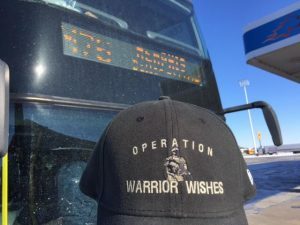 Operation Warrior Wishes would like to send a special thank you to Rand and the St Louis Blues for going above and beyond to provide an unforgettable experience for Greg & his wife. They truly enjoyed the suite! We also would like to thank Hard Rock Cafe for their continued support in St Louis. 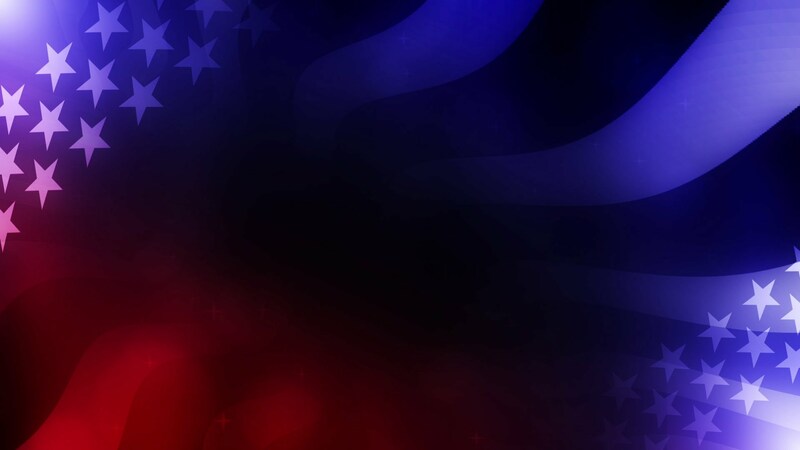 Most importantly we want to thank Air Force Veteran Greg Miller for his service & sacrifices! 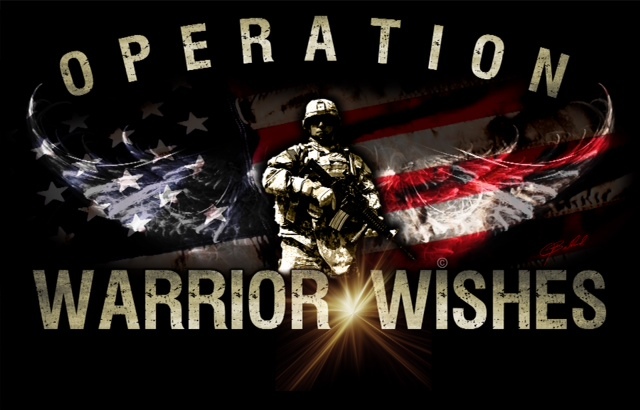 Honoring The Legacy Of Army SGT Mike Knapp At The Cactus Bowl!